After the strict fasting of Lent, an explosion of "forbidden" foods appears on the Eastern European Easter table. There is no better example than these slightly sweet yeast loaves of bread full of butter, sugar, and sometimes, cheese. A staggering number of eggs, a symbol of fertility, rebirth, spring, and the Resurrection figure prominently in them. Their names are often some form of the word ​paska, which means "Easter." In addition to an Easter bread, some countries also make a molded cheese dessert. This rich, Eastern European egg twist recipe is a slightly sweet yeast bread that exists in almost every culture. Bohemians and Czechs call it vanocka or mazanec, while others refer to it as houska. 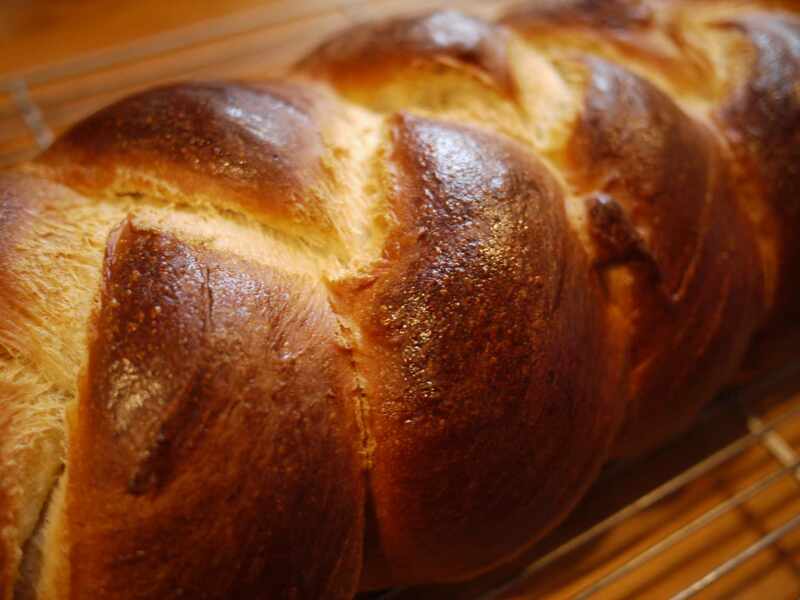 Poles, who call it chałka, adopted it from their Jewish countrymen who refer to it as ​challah, and on and on. Leftovers make great French toast and bread pudding. This Bulgarian Easter bread, known as kozunak, is featured at Christmas, Easter and other special occasions. It is an egg-rich braided loaf stuffed with rum-soaked raisins. Croatian Easter bread dolls take center stage on a table all decked out in Easter linens, silver, and crystal. Kids love them. But the most popular Easter bread is a sweet yeast-raised round loaf known as pinca or sirnica. A small loaf of this cake-like bread is placed in the basket of food to be blessed on Holy Saturday. This recipe for Czech Easter cake or velikonoční bochánek (veh-lih-kaw-nawtch-nee baw-khah-nek) is identical to Czech Christmas bread or​​ vanocka except for the shaping. Other Czech Easter bread is mazanec and Judas Buns. This recipe for Hungarian Easter egg bread or fonott kalacs is a slightly sweet braided loaf with raisins served for Easter, Christmas, or any time of year. In general, kalacs (kaw-lahtch) refers to any yeast-raised cake or sweet bread. Lithuanian Easter bread is similar to many other Eastern European offerings―a sweet yeast dough with raisins. It's delicious on Easter morning slathered with butter and a good accompaniment to the hard-cooked colored eggs everyone "clinks" together to see whose egg is the strongest. This recipe for Polish (HOW-kah) egg twist bread, is a rich, bread that may or may not contain raisins. It's similar to Bohemian-Czech hoska, Jewish challah, and French brioche. Chałka is served year-round, but especially at Christmas and Easter. If you have any leftover chałka, it makes delicious French toast, bread pudding with orange sauce, or makówki (Polish poppy seed bread pudding). Romanian Easter bread is called the Italian panettone of Romania because of its shape and similar texture. Bulgarians serve the same bread but call it kozunak. When Romanian Easter bread dough is filled with farmer's cheese, it becomes the delicious pasca, which, in turn, is similar to Polish kołacz. Russian Easter bread takes the form of kulich, a tall, cylindrical sweet yeast-risen bread. On Easter morning, Russian ladies engage in a little good-natured rivalry centering around who has the tallest kulich while waiting for the priest to bless their basket of delicacies. This sweet Serbian Easter egg bread features red hard-cooked eggs, symbolizing the blood Christ shed and his rebirth or resurrection. Some people shape their bread into a cross with an egg at the head, foot, and arms of the cross. This is very similar to Bohemian houska. This recipe for Slovak Easter bread or paska (PAH-skah) is made into round loaves decorated with religious symbols made of dough. It also can be shaped into paska peeps―small, chick-shaped rolls.